Canadian wildlife is an important part of a Canada Vacation. If you are like most travellers you want to see a bear and if possible get a close-up picture. Canada has a large bear population lots of other wildlife. 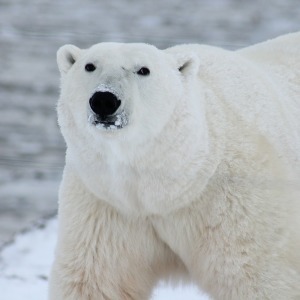 From the three bear species, the polar bear usually doesn’t come into contact with tourists. On the other hand, black bears and grizzgly bears live in areas that people visit. Cougars (Mountain Lions) are also common in many areas. I highly suggest you learn about the Canadian wildlife before starting your trip. This will help you appreciate the wild animals of Canada and will keep you safe. Learn to respect the wild animals. Know of the dangers in the wilderness and know what to do in risky situations. Remember, any cornered animal left without escape route is likely to attack. Buffalo, or bison, is an example for that. Buffalo used to roam our country. The peak population was in the millions in North America. For the Plains and Metis people, buffalo was the primary food resource until in the 1880s. By the late 19th century their numbers were in the low hundreds, to the extent that perhaps less than 100 remained. One hunting method was to chase the buffalo herd over a cliff where they got killed in the fall or were butchered. Head-Smashed-In-Buffalo-Jump in southwestern Alberta is one of these kill places, now a United Nations World Heritage Site. It has to be on your “To See List” when visiting Canada. Today, fewer than 30,000 wild bisons are in conservation herds and fewer than 5,000 live in the wild. You can read more about the history and the fate of the buffalo in North America on Wikipedia. Did you know that we have wild horses in Canada? Wild horses are not considered as wildlife. The majority of wild horses are found in Western Canada and it’s estimated to be between 800 to 1,000 free-roaming horses in the Chilcotin area. Unfortunately, the Province of British Columbia refuses to recognize the wild horse as a species with a right to remain on the land. Various societies are trying to protect the wild horses but without too much luck. Learn how the Canadian wildlife is adapting to the declining living space. Find out which wild animals are plentiful and which ones are endangered. Learn where you can find them and how you can help them. The black bear is probably the first animal that comes to your mind when you think about Canadian wildlife. 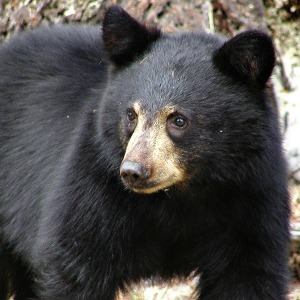 Intelligent, curious, always in search of food, black bears quickly learn that where there are people there is easy food. Humans rarely tolerate the bears or blame themselves for bear incidents. 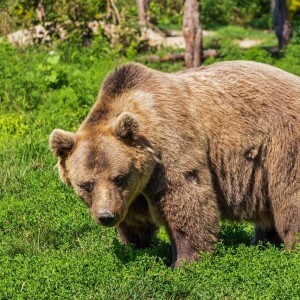 Since the dawn of time, humans and bears have lived uneasily together, sharing the same foods and the same habitats, avoiding each other as much as possible out of wariness and fear. Where human populations grow, bears slowly disappear as they lose their natural habitat. Polar bears are the biggest bears in the world, and polar bears, unlike blacks and grizzlies, are truly predatory and meat makes up more than 90 % of their diet. They hunt seals and other marine mammals all through the long arctic winter and head inland to the Arctic coast as summer approaches. Canada supports the largest grey wolf population in the world, after Russia. Historically, wolfs used to range in most areas of Canada. 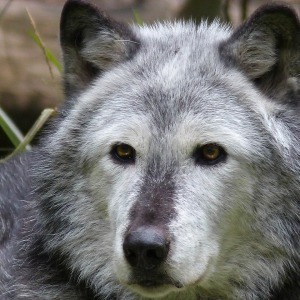 Currently, wolfs in Canada occupy about 90 % of the historic range. It’s usually not the country people, who idealize the wolf as one of the noblest and romantic wilderness animals. 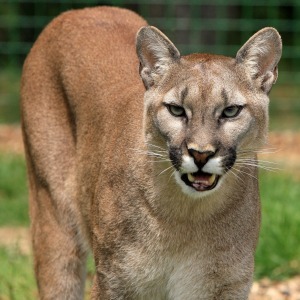 While cougars once ranged across most of North America, they have been forced into a small part of their original range. Today they are only found in the west, in areas of heavy forest and rocky hills. While rarely seen, they are quite common through the Rocky Mountains. The cougar thrives in the foothills of western Alberta and in the dry interior valleys and the coastal rainforests of British Columbia. No Canadian wildlife without the Moose. Moose are huge! 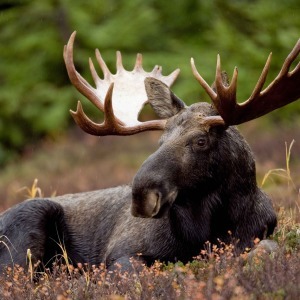 Moose are the largest members of the deer family and the tallest mammals in North America. They stand taller at the shoulder than the largest saddle horse. Moose are naturally gifted swimmers and even the calves can swim. Because Moose can’t sweat they prefer a cold climate and can’t tolerate temperatures above 27 degrees Celsius for long. 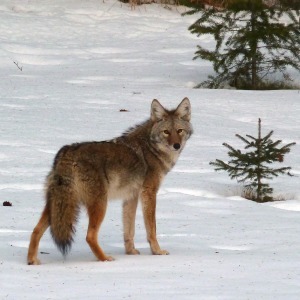 Almost anywhere in western Canada, you can hear the song of the coyote. High-pitched yapping and shrieking make it sound like a wild party is going on somewhere out there in the darkness. It is an airy sound to listen to when laying in a tent late at night, all by yourself. Coyotes are native animals in western Canada thriving in spite of changes caused by humans over the past century.